KTI Computer Services – We resolve all your frustrating Computer Issues! 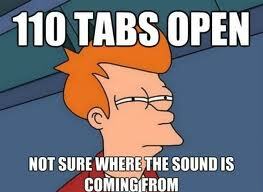 Keeping many Tabs opened at once allows for advanced Web navigation. However, this can also cause significant confusion and frustration when all of a sudden an unidentified sound is coming from the computer, yet the source cannot be located. Oftentimes, this problem can be fixed by going through all the opened tabs one by one and scanning the websites for the annoying audio until the source has been found; a very tedious task. In some cases, though, the sound may stem from spurious commercials triggered by spyware or other malicious programs. This entry was posted in Computer Repair on July 1, 2013 by media. For the best computer near sioux city I always have gone with and will always go with CSComputers in Sioux City. I could be wrong but I think that might help you, if not send me a msg. Thanks! It’s really a cool and helpful piece of information. I am happy that you simply shared this useful info with us.